Oh boy. I'm going to try and not think too hard about this one. I still have no idea what color my parachute is. Ok, so there are two schools of thought with this question. I could dig deep into my psyche about what truly makes me happy, and fulfilled and where my heart belongs. On that note, I would either be a mom to three little half-pints with one on the way, OR I would be building schools in countries where girls are under educated and considered second class citizens. After all, you "educate a woman, you educate a nation." Second school of thought is the popcorn version. It's fun, makes you happy, but doesn't really give you the oomph of satisfaction as the above criteria. That particular dream job would be a local foodie. Others would pay me to eat at all kinds of new and delicious and interesting foods. I would tour the valley sampling the best sushi, Thai, BBQ and taco stands each city has to offer. I wouldn't call myself a food critic, because I really, really like food. I'm not that critical. My favorite would be the authentic, mom and pop places. Places where Grandma Juanita's flan recipe was handed down 3 generations, then to my plate. I would of course do some brilliant write up in a hipster magazine where everyone who read about my food exploits would add my latest conquer to their own food bucket list. Yeah, I could see myself very happy doing something like that. I don't really need to go into much detail about the "why" behind this question, do I? 1)Primanti Brothers sandwich at a Pirates game in Pittsburgh. Oh brother, this was a eat with both hands, need a napkin for your elbows type sandwich. There were fries IN the sandwich! 2) Flo's Clam Shack, Newport R.I. Oh Flo's. I love you. I miss you. I dream about your clam strips and stuffies. What you can't see is that the Atlantic ocean and row of turn of the century mansions are just a few clicks to the right. Best view for eating fried clam strips ever. 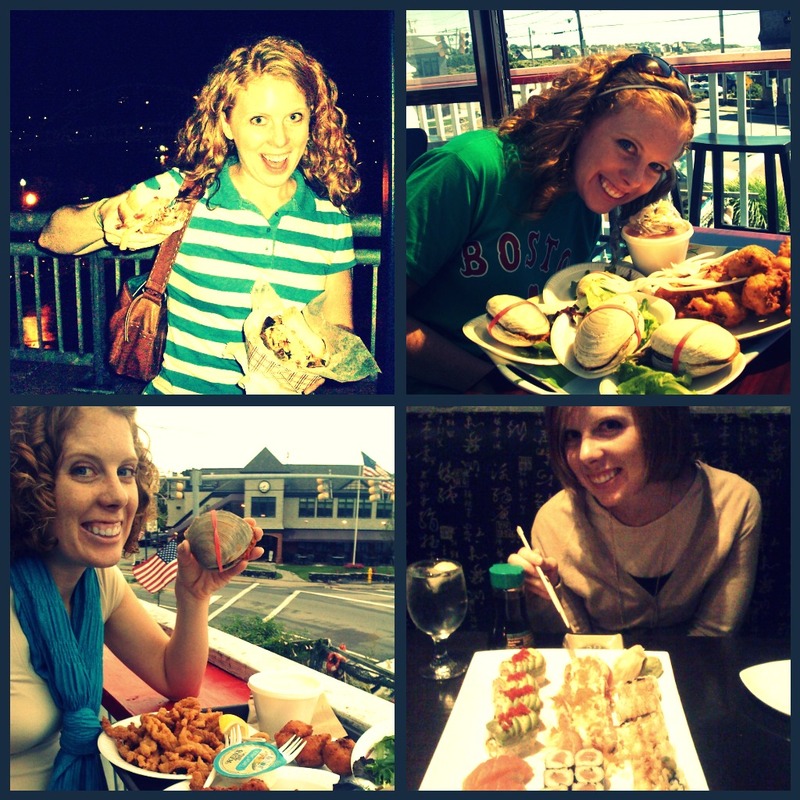 3) Sushi feast on my 29th birthday. Some hole in the wall joint in Middletown, CT. It was good. 4) Uh, Flo's again. Different year. Who's ready to hire me? Cute! One version of my perfect job would have me being the one preparing some of that local food for you in my little downtown diner. Maybe I'll meet you in this version of reality one day in the future. love it. i want to join you. i'll eat with you and then be your editor. ooooooh wait. you're an english major. you don't need an editor. cripes! just a sidekick maybe? yes? I'm in my dream job looking to add a little frosting on top. As for the food thing, I still remember the April 1st Thai dinner. It was no joke, you really took me to Thai food and I had to try it. Needless to say, that was the last time me do Thai...ugh. Frosting good, Thai bad. @CoachGalley! I can't believe I didn't convert you. I think the only thing you ate was the chicken satay. That's basically grilled chicken with a side of peanuts! @mindy, your aware my past education credentials our not what their cracked up to be. But I've always wanted a sidekick! Done.